I never thought I’d be a motorcycle mama, but here I am at nearly 60, early awaiting a 70-degree high on Saturday so Ralph and I can take the bike somewhere. It doesn’t matter where. Just as long as we go, explore, discover, and share our discoveries. That’s what Ride Minnesota is all about. Sharing our discoveries about our home state with others. in St. Paul. A good friend of mine, also a writer, had to interview someone for a magazine article and asked me to go along. While she conducted her interview, I poked along in the museum and looked at the exhibits (always good, highly recommended!). I can never resist a bookstore, so it was natural that I wound up there. I found several books about various types of Minnesota tourism–hiking in Minnesota, biking in Minnesota, paddling a canoe in Minnesota. There were no books about motorcycling in Minnesota! The lightbulb came on. That’s how Ralph and I came to spend every available good-weather weekend cruising the highways on our Victory, looking for hills, curves, unique scenery. That’s how Ride Minnesota was born. 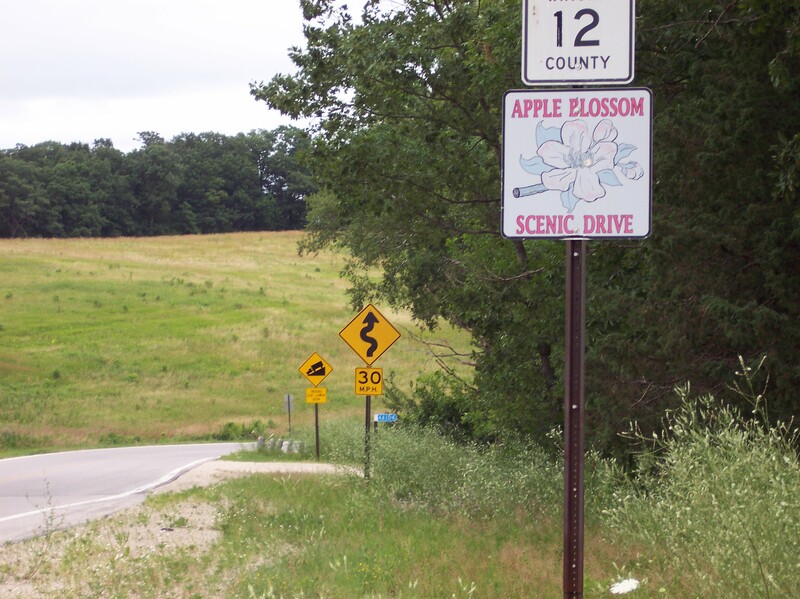 One of the more interesting rides is the Apple Blossom Scenie Byway, south of Winona. As the photo shows, there are curves ahead! Posted on April 25, 2013, in Minnesota, Minnesota tourism, Motorcycles, Ride Minnesota, Victory motorcycle and tagged Apple Blossom Scenic Byway, Minnesota, Minnesota History Center, Minnesota tourism, Ride Minnesota. Bookmark the permalink. 2 Comments. As much snow as Minnesota has had this year, I bet motorcyclist are psyched to ride! We ARE! The old man put on his leathers and rode to work for the first time today. Last year this time, he’d been commuting by bike for a month.